Levenhuk produce a wide range of optical instruments and accessories including microscopes, telescopes, spotting scopes and binoculars. With their headquarters located in Chicago, USA and manufacturing facilities in China, they have a direct presence as well as a number of dealers located in the US as well as Canada and parts of Europe. Levenhuk Optical Instruments have a fairly wide selection of binoculars, most of which are within the cheap to mid level price categories and thus should appeal to those new to optics or who are shopping on a budget. The Monaco is their highest quality series in the mid to high value range, all of which use Bak-4 roof prisms with dielectric coatings for the highest light transmission levels possible which is impressive. The Energy Plus range is one of their low cost options, but still come with water and fog proof shells that protect good quality BaK-4 glass prisms and fully multi-coated optics. The different ranges and available sizes mean that they cater for most general and outdoor uses including birdwatching, hiking, hunting, sports observation and general wildlife observation. Whilst they don't have a specific binocular designed for children, their lower priced, compact bins look to be a great option for older kids and teenagers. 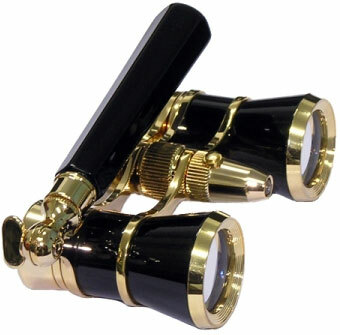 Levenhuk also produce a wide range of opera glasses or theatre glasses as they are sometimes referred including some Lorgnette glasses and all come under their Broadway range. 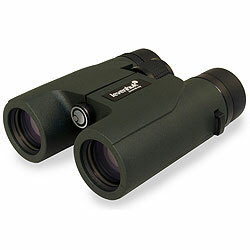 The Monaco is currently the flagship range from Levenhuk that that I would describe as being a mid level binocular. There are currently six different models that range in size from the compact 10x25 to the high powered and large 15x56 Monaco that is an ideal as a long distance observation bin. 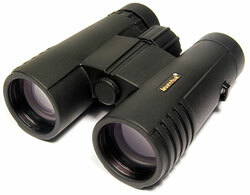 The 8x42 Monaco is as you can read in my review a great mid level, all-purpose, general use binocular. 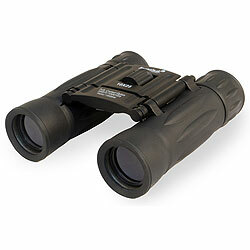 All Monaco binoculars come with fully multi-coated lenses and BaK-4 glass roof prisms that have a 57 layer dielectric coating, for the highest light transmission levels and which I have to say is an impressive inclusion at this reasonably low price point. 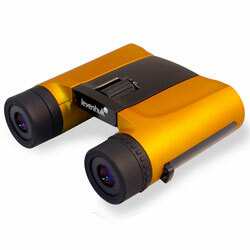 The body is a fairly standard and proven design for a roof prism binocular with a single bridge and large central focus wheel. They are fully sealed and filled with nitrogen making them both water and fog proof. The have twist-up eyecups and the diopter adjustment positioned in the standard location near the right ocular. All models, including the compact 10x25 model are tripod adaptable and come with a neck strap, lens covers, cleaning cloth, nylon carry case and an impressive lifetime warranty. The budget friendly Levenhuk Energy PLUS series currently consists of nine models, all of which use roof prisms made from BaK-4 glass and are fully multi-coated which is good to see at this low price point. 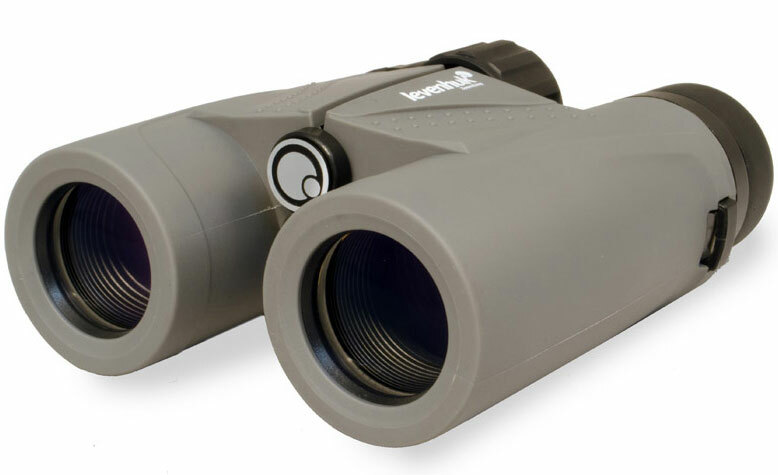 Levenhuk Energy PLUS binoculars all have waterproof shells (3ft for 60 seconds), and a single bridge body design with a large centrally located focus wheel. The have twist-up eyecups and diopter adjustment located near the right eye-piece. Energy Plus bins come with a Nylon carry case, objective and ocular lens covers, neck strap, cleaning cloth and a lifetime warranty. 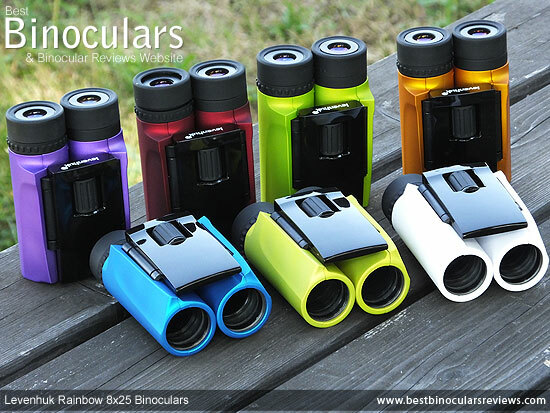 The Rainbow series consists of seven very colorful, low cost compact binoculars. 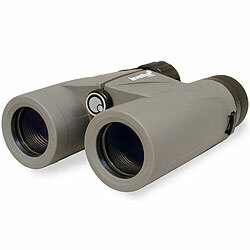 Optical features include the use of BaK-4 Roof Prisms and Multi-Coated Optics. The chassis are completely sealed and filled with nitrogen gas making them water and fog proof. 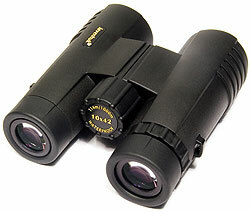 They also feature twist-up eyecups, something that is fairly rare at this price level on a compact. However the biggest highlight for me is their double hinge design, which allows them to be folded up into a tiny package when not in use - these are true pocket binoculars. As with all other Levenhuk binoculars, the Rainbow comes with an excellent worldwide lifetime warranty as well as a cleaning cloth, neckstrap and carry pouch. There are currently 7 models within the Rainbow series, all of which are identical apart from the colors. Colors available are White Snow, Red Berry, Orange, Lime, Lemon, Blue Wave and Amethyst. With 9 different models (see below), the Levenhuk Karma Pro series is another large range and is the top of the line option within their Karma family. All models use roof prisms and range in size from the compact 25mm versions, right up to the large 50mm options. Boasting a four-element eyepiece design that helps ensure as wide field of view as well as produce a higher quality image, than the simpler designs used in their cheaper Karma Plus range. Other highlights include a fully sealed shell with fogproofing, fully multi-coated optics and silver mirror coatings on the prisms. The Karma Plus series is very similar to the Karma Pro's (see above), but is placed at a slightly lower price point and as such there are a few important differences to be aware of. Firstly instead of the 4 element eyepieces, these have a 3 element design, which vastly affects specifications like the field of view and close focus distance. Secondly they only have multi-coated optics instead of the fully multi-coated system in the Pro series. 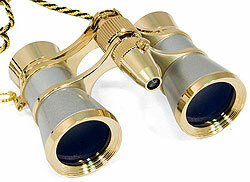 They are also available in a slightly different range of sizes and magnifications (see below). Most of the other changes are quite minor, you can read about them all and their effects in my full review of the Levenhuk Karma Plus 8x32 Binoculars. The Atom is a basic entry level series with all of the models coming in under $45 / £40. The series contains a number of roof and porro prism models, all of which have fully coated optics and as with all other Levenhuk's you get a worldwide lifetime warranty. The roof prism compacts utilize my preferred double hinge body shape, which makes them far more compact when folded and gives them a much wider range when adjusting the IPD settings. Designed to be taken and used at the theatre or opera, Levenhuk Broadway Galilean binoculars have a 3x magnification with 25mm objective lenses (3x25), a wide field of view to make sure you can see all the action on stage and come in a wide variety of styles to suite most people preferences. 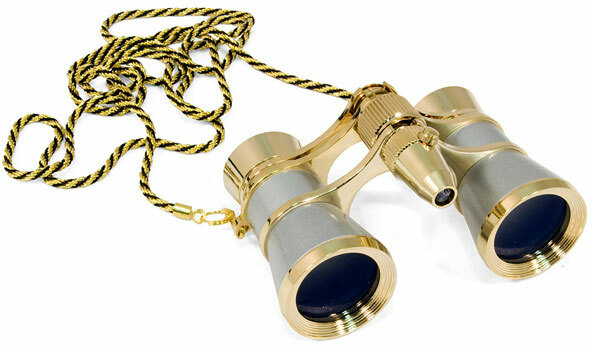 Some models come with a chain and others with a telescopic handle that enables you to adjust the lorgnette for your needs. LED flashlights are also integrated on some to help you locate your seat in the dark without overly imposing on others in the room. All models have a central focusing and you can adjust the interpupillary distance to ensue that you can match them to the distance between your eyes. The optics are fully multi-coated, which is good and better than many others out there at this price this helps to ensure that they produce a bright as well as good quality image even in dark theatre halls. 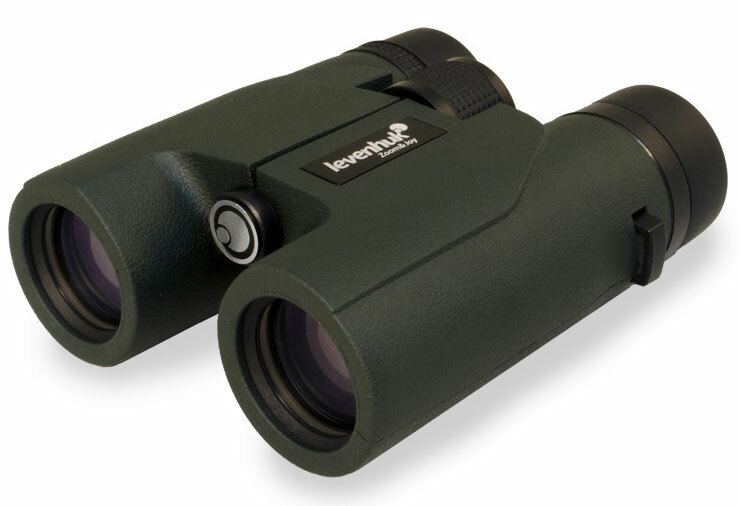 Levenhuk Broadway binoculars come with a carry pouch, suede cleaning cloth and an impressive lifetime warranty. 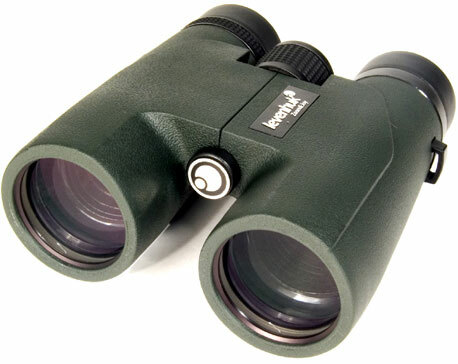 Below are some featured and fully reviewed Levenhuk Binoculars: View >> All the Levenhuk Binoculars that I have reviewed.